Student protesters blocked several entrances to the Wits University main campus very early on Thursday, February 7, with dustbins and rocks, preventing vehicles from entering the campus. The protest was part of the SRC-driven campaign to force the university to allow students with historical debt of less than R100 000 to register and secure accommodation for the 2019 academic year. Some 100 students barricaded the entrances at Yale Road, Jubilee and Flower halls and Sturrock Park. Armed policemen arrived at the scene around 09:00 and pleaded with the SRC president Sisanda Mbolekwa to leave the entrance, however, she refused. The crowd was dispersed moments later when a stun grenade went off, forcing the students to seek refuge outside the Sunnyside Hall of Residence. It was here where Mbolekwa and another protesting student instructed this Wits Vuvuzela journalist not to record or take photos of the meeting. When she continued to take photos, the journalist was verbally harassed by the crowd with some threatening to break her equipment if she did not delete content of the meeting. 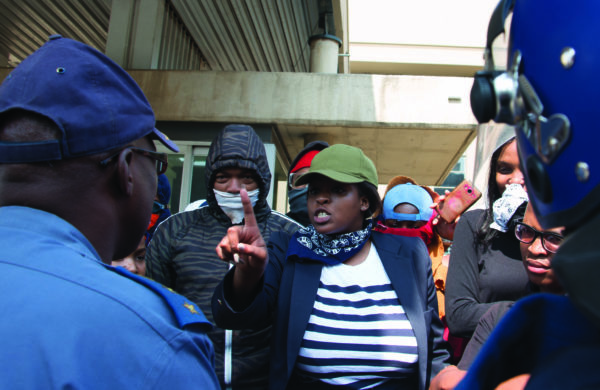 SRC gender and transformation officer, Sibongile Sibeko, told Wits Vuvuzela that, “Students have decided to go the route of a shutdown because we keep getting the same responses from university management. “We are told that they (the university) have filled [160 beds] … yet we still have students that are sleeping in our offices, sleeping in libraries, sleeping in toilets because they don’t have accommodation,” Sibeko added. The university released a statement shortly before midday, condemning the behaviour of the protesters. “This morning we had a group of about 50 masked people who blocked the entrances to Yale Road North and South by placing rocks across the road. They are also attempting to disrupt lectures on the Braamfontein Campus West. With the aid of the police Yale Road has been cleared and the individuals who are attempting to disrupt lectures are being rounded up,” the statement read. “…We are of the view that these individuals do not have the interest of our students at heart. Their aim is to disrupt learning and to hold higher education institutions to ransom in order to advance their own political agenda. Their agenda has nothing to do with free education but is rather a deliberate attempt to destabilise our University. “We need to expose these persons who are today on our campus trying to disrupt our lectures and to shut down our campuses. We need to expose them, suspend them if they are students and have them arrested if they are threatening people, infringing on the rights of others to learn and work and damaging property. On Wednesday, about 250 protesting students from Wits, University of Johannesburg (UJ) and Central Johannesburg Collage led by the EFF Student Command marched to various Johannesburg institutions of higher learning. When they got to the UJ Kingsway Campus they started pelting private security personnel with stones. When the security guards retaliated, a UJ student was left bloody after sustaining injuries to the head.